Welcome to the new Internet home for Triangle Press. Located in Mohawk, Tennessee, Triangle Press has been in business since 1918. 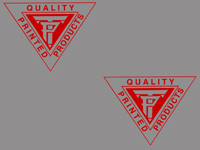 TP is a commerical printing company that specializes in custom printing. The goal of Triangle Press is to offer small town prices and 100% satisfaction. Take a look around the site to see some samples of our printing work and learn more about our company. To contact us, simply click the contact page link on the left side of any page. We look forward to serving your printing needs. Triangle Press is always looking to make our customers our #1 priority. And to do that, we enjoy taking feedback on our services and now on our new web site. Simply go to the contact page and drop us a line about our services or our web site. We want to make your experience with Triangle Press the best it can be.